This customizable exam prep package provides you with Gold Coast’s complete set of professionally written practice exam questions that will help you prepare for the Florida Life, Health and Variable Annuity Exam needed for your 2-15 License. Our practice exams will help you pass! What to Expect in Your Health Insurance Exam! The State Exam is given electronically in a four-option, multiple-choice format. The State Exams are designed to test knowledge as well as application of principles. Our Gold Coast practice exams are designed the same way. 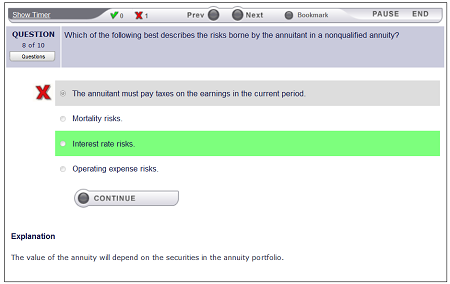 A Life, Health and Annuity Insurance candidate has to score 70% on the State Exam to pass. You will be given 2 hours and 45 minutes to complete the State Exam. Our practice exams will cover all of the topics found on the actual license exam, and allow you to simulate the exam experience! If you have any further questions about which exam prep is right for you, contact our Career Counselors at 1-800-732-9140. We will be more than happy to assist.